Honeycomb, Hydrophilated Polyester; solvent resistant,durable, absorbent, stays soft. Made in USA. Applications: General cleaning, sponging seams & washing walls, for all home, auto and marine cleaning. 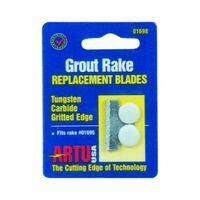 Angled replaceable blade for optimum grout removal. Safety orange color. Used to maintain even spacing between tiles, floor and wall; easy to remove. Used for evenly spaced wall and floor tile. Easy to remove. Used for evenly spaced wall and floor tile. Easy to remove. For accurate tile alignment. For accurate tile alignment. Sponge is made of honeycomb, hydrophilated polyester which is solvent resistant, durable, absorbent and stays soft. Made in USA. Applications: general cleaning, wallpapering, tile and grout work, for all home, auto and marine cleaning. For spreading or removing tile grout. Used to wipe excess grout from joints. Corners rounded to prevent digging or marring joints. Tungsten carbide grit edge cutting blade. Toothed steel blade to remove debris. Bright metal finish is corrosion resistant. Fits grout remover sku #960.2616. General purpose cellulose sponge. Shape conforms to hand. Holds water very well and washes clean. Applications: Wiping down walls, floors, wallpaper. Natural and synthetic fibers set in platic block; designed to ease work when scrubbing tile and grout lines, floors, baseboards, walls and countertops. ARTU Replacement Blade, Suitable For Use With: 2 DIY Grout Rakes, Carbide Grit, Applicable Materials are Brick, Cast Metals, Ceramic Tile, Cement Backer board, Composites, Fiberglass, Flagstone/Slate, Glass, Hardened Steel, Reinforced Cement, Stranded Cable, Laminates, Marble and PVC, For Do-It-Yourselfers Use for holding and dispensing grout or mortar. Made from seamless black vinyl.